September is really the month of celebration in our home now. Our baby girl arrived two weeks before our fourth wedding anniversary, and later this month, This American Bite will celebrate it's first birthday. Over the last year, I have established myself as a food blogger and demonstrated how healthy, kosher, and local food can be made in the home kitchen. During this journey, I have also had the honor of guest posting on a variety of other blogs, joining the Kosher Connection and making blogger-friends like Tamar and Ronnie who have been willing to guest post while I am focused on celebrating the birth of my baby girl. Tamar Genger, founder and editor of Joy of Kosher is an advocate for kosher culinary excellence. It has been a privilege to share my dishes with the Joy of Kosher audience, and it's a pleasure to hand my blog to her for the duration of this post. Without further ado, let's make grapefruit ceviche! 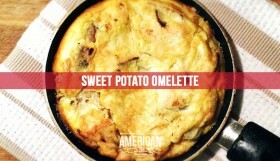 I want to thank Yosef for giving me the chance to guest blog on This American Bite. Although Yosef is an unrepentant carnivore, I know he cares about health. He recently confided to me that he was looking for more Shabbat (sabbath) lunch ideas. Somehow, he has been lucky enough to get invited out most weeks, but with a second baby on the way he needs more “in house” ideas and I am happy to oblige. As a Dietitian, I like to offer healthier alternatives to traditional Shabbat lunches. During the heat of the summer, I have been exploring all sorts of cold fish recipes that are perfect for Saturday lunch. In my house, on the rare occasion when we don’t have company for lunch, we can literally make a meal with a salad, challah and chummus, but for company we offer sushi, ceviche or tartar as a unique appetizer that everyone enjoys. 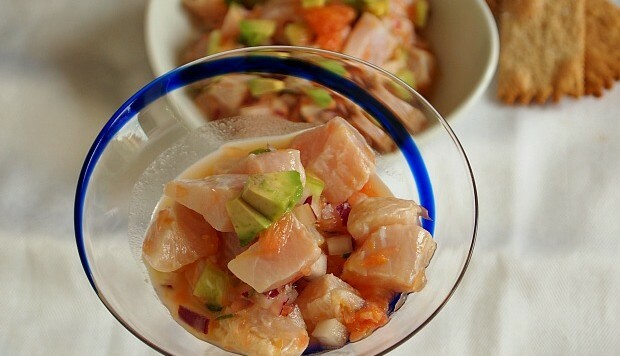 Usually, ceviche is made with lemon or lime juice, because the high acid content helps to “cook” the fish. Recently I found I did not have enough lemon, but I did have a grapefruit lying around and this refreshing Grapefruit Ceviche was born. 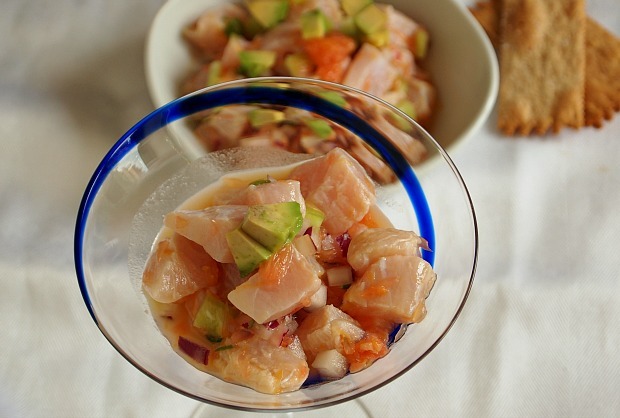 I made this ceviche with tilapia, but any flaky white fish will work just fine. The marinade should sit at least an hour before serving, but is usually better the next day, which is why it works so well for Shabbat lunch. Combine grapefruit zest and juice, lemon zest and juice, jalapeno, honey, oil and salt and pepper. Mix well. In a non reactive bowl, mix fish with grapefruit segments, onion, peppers, and cilantro. Pour dressing over top and mix gently. Adjust seasoning to taste. 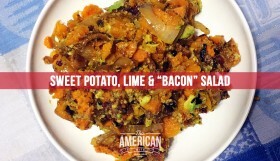 Place in fridge to marinate at least 2 hours. When ready to serve add avocado and stir gently. Serve in martini glasses for an elegant presentation.